The challenge this week is to use texture paste with stencils. 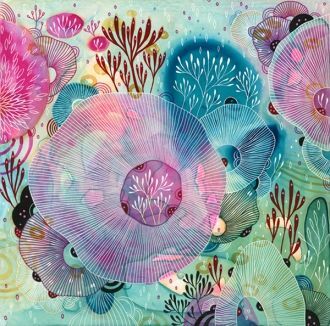 I still don’t have any Papertrey Ink stencils, so once again the challenge for me is to find a Papertrey Ink substitute that I can use. This is another project that looked better in my head than on paper, but it is kind of OK. The biggest bummer for me was opening four different jars of embossing paste, only to find that they were completely hardened in the jar. Luckily, my Ranger texture paste was “good to go” and I could just add some spray mist to make it blue. If anyone has a foolproof way to store embossing paste, please let me know. 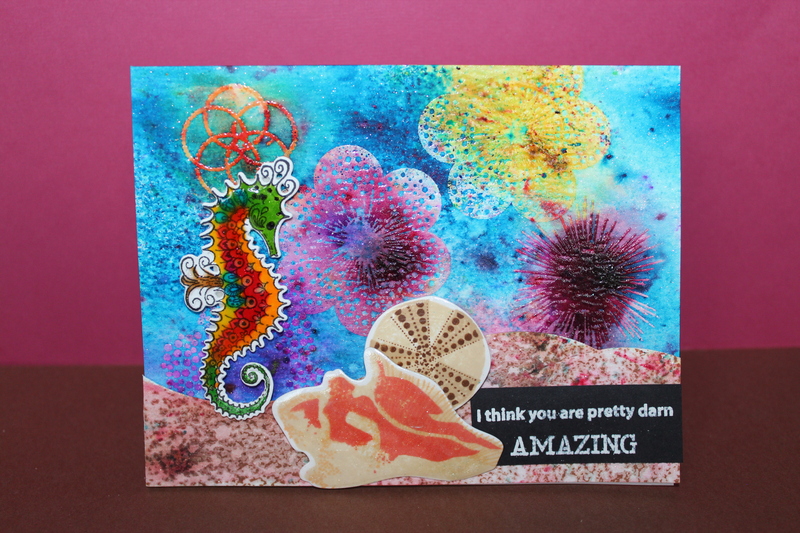 Supplies: Papertrey Ink What the Doodle Wave die (made into a stencil), Papertrey Ink Keep Swimming stamp set, Ranger Texture paste,Radiant Rain Mist, Hero Arts and Simon Says Stamp dye inks, recollections cardstock, Hero Arts card base and Scor tape. 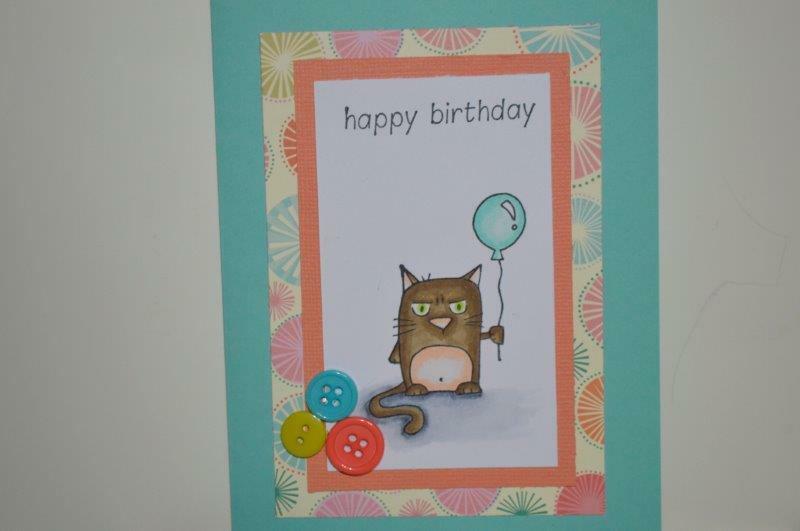 I am hurrying to get my card into the blog hop for Papertrey Ink. I loved the inspiration photo, so I knew I had to try and make something from it. This is my second attempt. The first was OK but I thought I could do better, so it was back to the Misti, to start over. Would you like a Coffee……….Bag?? I decided that I needed a coffee break from making coffee cards and so I decided to make a coffee bag instead. I cut the bag out on my Pazzles cutter and hadn’t even noticed the funny little closure on top. When I went to put it together, I wondered how I was going to deal with that. The holes were too small to thread through the coffee ribbon that I wanted to use, but to leave them there made it look like the bag had eyes. Looking through my stash, I found Tim Holtz’ bathroom (ball chain) chain and a lock charm. Perfect, as it signifies that a coffee gift is precious and needs to be under lock and key, so to speak. Anyway this little bag was easy to put together and makes an excellent stocking stuffer. Two or three Tassimo or Keurig pods fit in the bag quite nicely. Well, here it is, my new stamp set, bought specifically for the Coffee Lovers Blog Hop. I think the stamp set is just new to me, and not NEW NEW. It is a great one though from Skipping Stones Design. I got another stamp set from them at the same time………..cause hey that is how I roll………………….always trying to make the shipping per item less $$. It is a great one too, and I already have a certain person’s Birthday card in mind for that one. But I digress……..
What attracted me to this coffee stamp set is the fact that it had exactly me and my Craft uniform as the main image. Really…………………hair askew, one of 3 ratty blue bathrobes on and my bunny slippers. This is the uniform I wear when I craft. The challenge I tell myself is to get dressed before the mailman arrives at 1:00 pm. This is a challenge I have failed at, .. many times. The mailman rings my doorbell every time I get a little stamp parcel. I think he likes to see me dance around (dressed , of course), when I get Happy Mail, but he could do without the ratty housecoat. 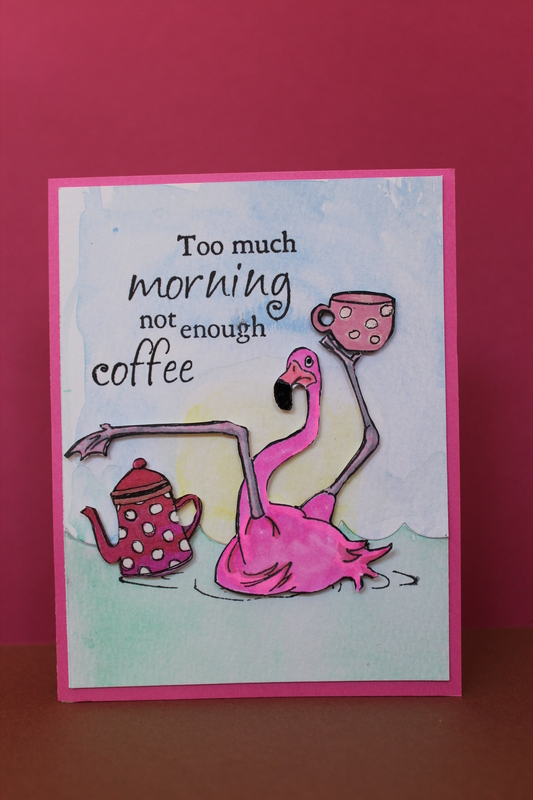 I decided to watercolour this card as that seemed to evoke the same disheveled look as the coffee loving crafter on the front of the card. I think it turned out well. Supplies: Skipping Stones Design Coffee set, Peerless Watercolors, Distress Watercolor Paper, Creatology fun foam, Simon Says Stamp card base , Pico Embellisher in Black, Mama Elephant creative cuts die, and Scor tape. We interrupt all the coffee craziness going on at the Coffee Lovers Blog Hop, to see what can be done with the Reverse Stencil Challenge at Papertrey Ink. I have to confess that most times my use of a brayer and inking of stencils ends up with a brayer that won’t come clean and ink everywhere but where I want it. This is a technique, I think. that is easy to do and very difficult to perfect. In the end, I came up with something that I think looks quite nice. The small butterflies are covered with Shimmer Embellisher to give them some dimension and the last picture does show the embossing details on the large butterfly.